I have a 720p mp4 file that is around 4hrs at 9.02GB. I want to significantly reduce its size in half without sacrificing video quality. The file was converted from a 1080p TS file but I have no access to the original. The reason why I want to do this is because I have another 720p mp4 file that is around 4hrs15min at just 4.27GB. As it is, the first file is taking up too much space in my drive. Why compress MP4 file size? 1.A much smaller MP4 video is quite easier and quickly for emailing. 2.To stream and play video smoothly on smartphone or tablet, it is quite necessary to compress MP4 video to small file size. 3.Although MP4 video is the best uploading format for YouTube, however, a large MP4 video will also effect your uploading speed a lot. 4. You can save more physical space on your hard drive. 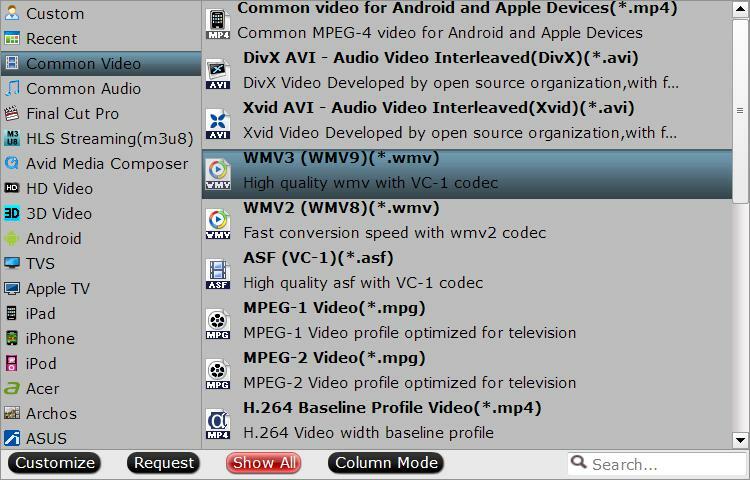 Besides MP4, there are other file formats such as FLV, WMV with small file size for compressing files. If you wish to compress MP4 for sending email or saving space on your hard drive, WMV is your first choice. For online web like YouTube, Vimeo, Facebook uploading, FLV can do this job best. Method 2: Change profile parameters. Video resolution: The higher the resolution, the sharper the picture. However, the higher the resolution, the larger the file size will be. Changing the original video to a smaller resolution will lead to a smaller file size. For HD MP4 video with a file resolution of 1920×1080, it’s recommended to reduce to 1280X720, 640×480, 640×360, and more resolutions. Bit rate: As for the bit rate, lowering the bit rate will bring about the decrease of the video file size. But please keep in mind the image quality will be bad in case you make the bit rate too low. Frame rate: The frame rate has a significant impact on the file size. Lowering the frame rate of your video to 15 or 10 fps can reduce the file size by as much as 1/2 or 2/3. However, reducing the frame rate may affect the smoothness of the playback. Acceptable frame rates vary depending on the specific video clip. You may have to experiment to find the lowest acceptable value. If you are looking for a way to compress MP4 files with no quality loss, trimming or cropping MP4 files is absolutely the most simple but effective way. Trim your unwanted segments from the video to leave only your desired parts. Crop the black bars around the video frame to play the video with full screen. It sounds difficult for you to find a program that can satisfy your needs to compress MP4 files with all the ways listed above. Fortunately, here comes Pavtube Video Converter, it can do you a great favor to convert MP4 to small file size WMV/FLV for email or web uploading, adjust profile parameters and trim/crop MP4 file size to remove unwanted segments or black bars. For Mac users, you can easily perform the same MP4 file compression process on Mac OS X El Capitan with Pavtube Video Converter for Mac. Step 2: Output a file format with small file size. 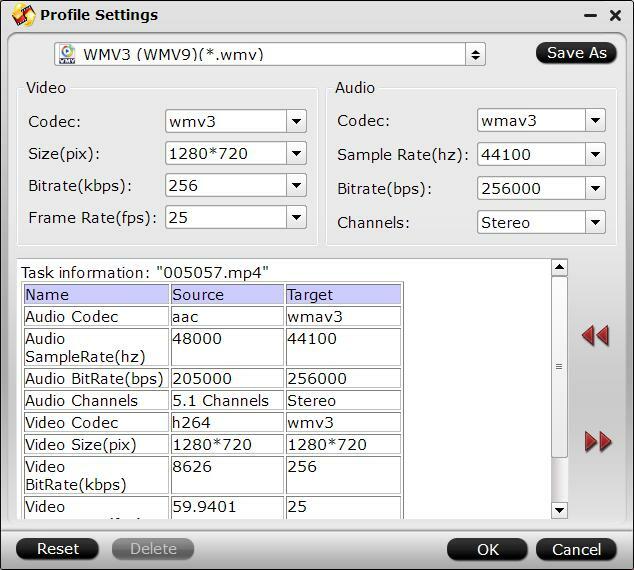 Change output profile parameters such as frame rate, bit rate and resolution to reduce mp4 file size. Please bear in mind, excessive reduction of the parameters will bring about quality degradation. This program can keep a good balance between the file size and image quality. You can simply leave the parameter settings unchanged after choose the output format. Step 4: Trim or crop MP4 file size. Trim: Click “Trim” button, you can drag the slider bars to include the segment you want to remain, click the left square bracket to set start point, and click the right square bracket to set end point when previewing the video or directly input specific values to “Start” and “End” box. 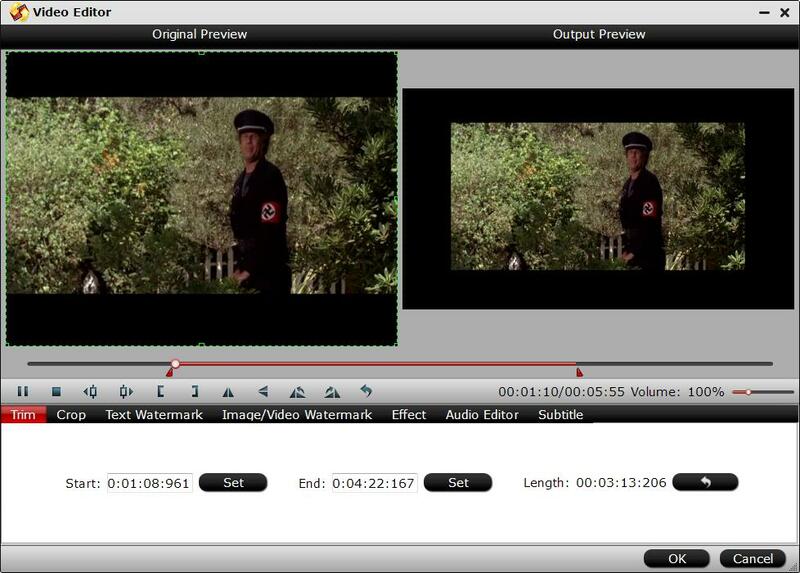 Crop: Hit the “Crop” tab, drag the green dash line around the video to remove the black edges in the video frame. Step 5: Start MP4 file compression process. Specify an output folder on your computer for storing the converted files. Then hit right-bottom “Convert” button to start to compress MP4 files on your computer. When the conversion is completed, you will have no problem when do file uploading or emailing with compressed file size. Above listed method can also be applied to the compression of AVI, FLV, 4K video, etc. How to Compress and Play YouTube 4K Videos on Android Phone and Tablets?